This is a feature of Ivinghoe village and is located at the main road junction in the centre of the village surrounded by some of the oldest properties in the parish, dating back to the 13th century. 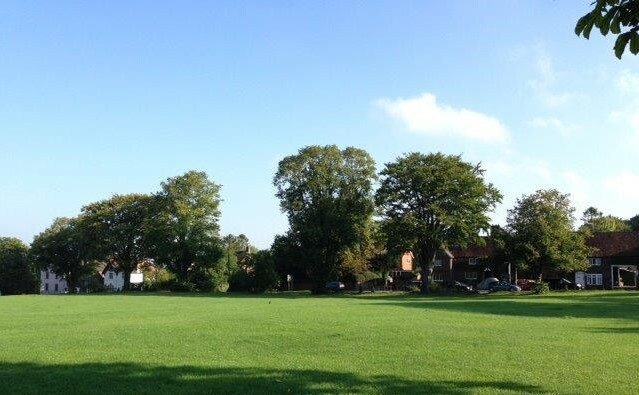 The Lawn, as the name suggests, is a vast area of grass in the centre of the village offering excellent views of the church, Kings Head restaurant, Town Hall and as well as extensive views towards the open countryside towards Ford End. The Lower Lawn, is a privately owned area at the bottom of The Lawn with several footpaths crossing it, and mainly used as a wildlife area. Additionally, The Lawn can be hired for use as carparking for weddings and functions, but are limited to a specific number of uses per year. If you wish to hire The Lawn, please use the contact form below. Please note: No booking is confirmed until you have received a confirmation from Ivinghoe Parish Council. You will receive an intial email with a copy of what you have submitted. You should receive your confirmation of booking within 7 days. I have read the Terms and Conditions for hiring The Lawn. I also understand that my booking is not confirmed until I have received a confirmation from Ivinghoe Parish Council.